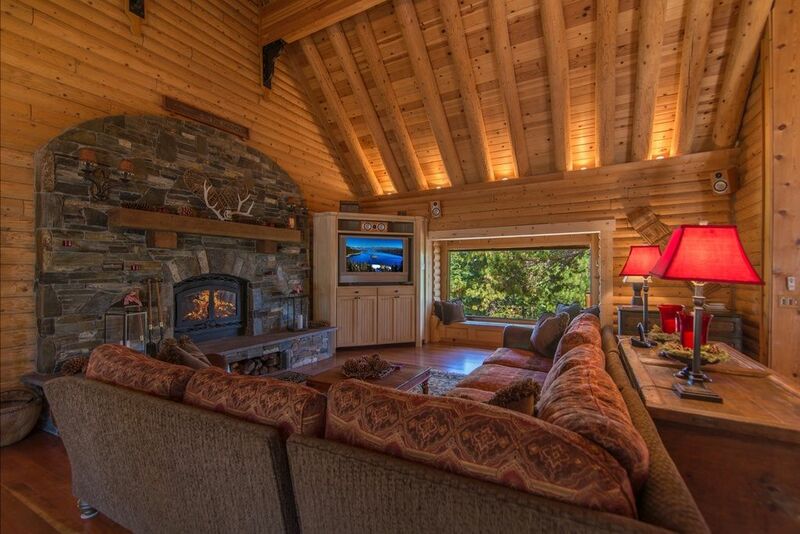 Juniper Log home, 7100+ sqft, spa, sur 80 hectares, Accueille les enfants, meilleur rapport qualité / prix! Maison de campagne rustique rustique située sur 80 acres de bois isolés, loin de tout. Parfait pour une retraite pour une famille ou un groupe. Près du centre-ville de Truckee et des activités et à environ 30 minutes en voiture de Reno / Casinos. Note: aucun événement, mariage ou motoneige n'est autorisé au Juniper Lodge. Beaucoup de place, 6 chambres et 5. 5 salles de bains, et un sous-sol fini avec table de billard, TV, Wii et table de carte et salon séparé. Faites une promenade / randonnée sur notre propriété, faire du vélo le long des routes secondaires, ou tout simplement profiter de la vue sur la montagne depuis la grande terrasse. Pour une soirée parfaite, faites griller des guimauves et des smores autour du grand foyer à gaz pour un dessert parfait! Les enfants peuvent s'amuser et se divertir dans notre aire de jeux extérieure. Juniper Lodge offre une vue imprenable sur les montagnes de la Sierra et le ciel, ce qui en fait un endroit parfait pour s'évader. Bureau 2e étage - Bureau dédié w / imprimante et espace pour travailler à la maison. - Vous devez avoir 32 ans et plus pour louer notre maison (id requis)! - Pas de mariages ou de grands événements sont autorisés sur notre propriété. - Les routes sont labourées avec la route principale, nous utilisons le même service que notre HOA. - 4 x 4 ou chaînes sont recommandées pour les locataires d'hiver. This is a beautiful property. Scenic views, plenty of space, private property with plenty of room to play in the snow. The home is very well built with many custom features. Unfortunately it is poorly managed. Upon arrival the home was filthy. You could tell it had been picked up and vacuumed but that was about it. The beds were made but the sheets did not appear to be clean so we had to do laundry for the first 6 hours when we arrived. The stainless steel appliances in the kitchen were very nice but were covered in dirty hand prints and food splatter. The windows and glass doors had finger prints and dog slobber on them. The basement had a ton of outdated random toys piled up in the corners. The televisions were very outdated and not user friendly. The basement still had VHS and tapes. Never could figure out how to use it which was a complete bummer because the kids ended up spending all their time upstairs with us. One of the reasons we picked this house was because we thought the kids would enjoy the basement/game room but due to the TV situation they did not. When changing the sheets in the room that backs up to the kitchen my brother discovered rat feces all along the wall between the head board and the wall. We had to keep this from his wife who would have freaked out. She has a huge phobia of rodents. The kids did have a blast outside though. Plenty of space for them to play in the snow. The owner did refund the cleaning deposit over 3 weeks after the trip. But after spending as much as we did to rent the place we would have much rather had the place cleaned properly before we arrived. My wife and our friends recently stayed at the Juniper Lodge and had an amazing time. 9 of us (plus a dog) fit perfectly in the house and we can't say enough good things about both the house and the location. Tranquil, beautiful, convenient to Truckee and the mountains...it was a wonderful trip and we may have to repeat it at some point! Huge House on a big property. Overall, we loved this house. The deck couldn't be better! The kitchen was great for a large group, and the extra frig downstairs was helpful. The whole place was comfortable, with plenty of dishes, cookware, towels, parking, etc. The location felt like we were all alone. There were a couple of negatives, the first being the lack of hot water in some of the showers some of the time...maybe there is a trick, but we couldn't figure it out. The other is lack of wifi for the 5 days we stayed there (we could get some internet on our phones). For us, these were fairly minor inconveniences, but may be more important to others. It is a great house, and I would stay there again. The house is beautiful, well-appointed, and comfortable for multiple families...and children of all ages. The surrounding forest which can be enjoyed from a big deck with comfortable seating is delightful. Our visit this year (August, 2018) was marred by some smoke from the multiple CA wild-fires, but we still had a wonderful time. We want to return next year! Beautiful secluded place for a family gathering. This is such a beautiful secluded place for a family gathering. The house is lovely, big, and has plenty of beds and bathrooms for all of our extended family. We especially enjoyed hanging out on the large deck with the beautiful view.